Check Out - Stratecution B.V.
"The proof of the pudding is in the eating"
Below you can read a short description on how to make with this DEMO your own PROFESSIONAL VERSION dashboard in 10 steps. The application and the live DEMO start as follows: this is just a decription on how it works. This is a MICROSOFT EXCEL download with the dashboard itself: EXCEL knowledge is not necessary. See examples below. the Strat/Assess textbook for support(online or off-line via premium pack): this a very comprehensive textbook on making business plans(printed some 550 pages) in HTML: it guides you through all key elements for making the dashboard and scoring for the dashboard. Key differentiator of the Strat/Assess textbook is the scoring of each chapter of the business plan via some 80 questions. The Strat/Assess textbook includes all necessary business plan formats, scoring questions and templates. These are also separately available in MICROSOFT WORD via the business plan pack or premium pack. 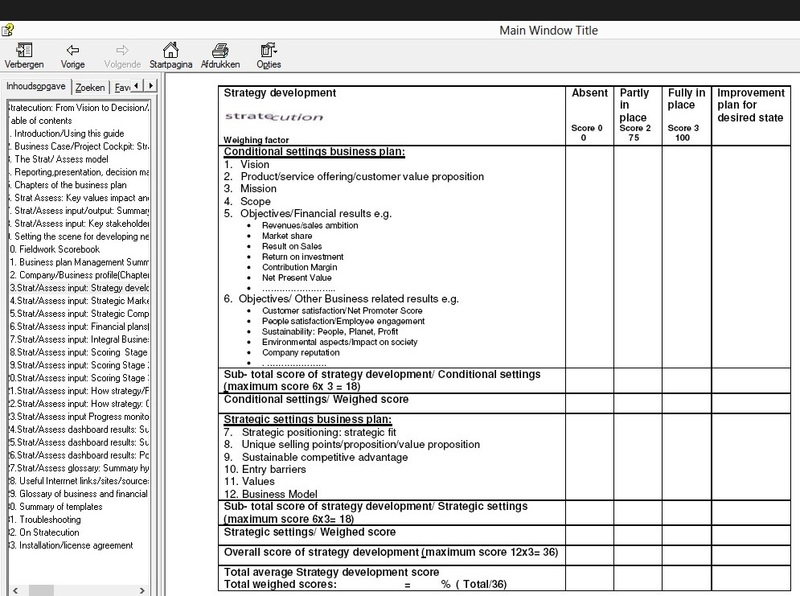 The scoring template is separately available via the MICROSOFT EXCEL field work score book. SCORING EXAMPLE on strategy: a minimum "fully in place" scoring of 90 % is suggested on 12 strategy elements and e.g. in case the score is lower than 90% the entire plan is subject for serious review. Bottom-up by completing the detailed scores of the Strat/Assess textbook and to transfer these to the forms below. We recommend to start top-down to get a first impression of the status of the business. Refinements can follow over time. This is to fill out the key sources of information. In total there are 4 possible datasets: you can compare over time the progress of the plan and adjust when appropriate. This will avoid overoptimism and too positive scoring: on the the next data set such positive scorings will be discovered anyhow! The reporting date serves as Net Present Value date. With the expected(variable) contribution margin the Net Present Value, cashflow and the return % and a real options indication will be calculated. Whereas scores market attractiveness are mostly a given, unlike you are a real market shaper bringing disruptive developments, scores on strategic competences may be improved over time to a 100% desired state level. The scores of the Strategic Market map /Strategic Competences map result in a risk indicator for the entire business. The risk will decrease proportionally by fully completing the competences. The external factors determine the business risk to a great extent, competences can in most cases be improved. The maximum risk score in this example is 62 % at a competences level of 100 %. Based on the Strat/Assess requirements as described in bottom-line decision making 62% risk is unacceptable. Such a project should be discontinued. According to the underlying theory a business will fail when not all scores are at 3 level at time of market introduction (at the latest) or when scored for an existing company. Transfer to the next stage should only be allowed when all scores are at a 100% desired state level or when convincing plans to reach this level within some 3 months are available. Based on the dashboard and if available a portfolio you can now start making decisions(this template is available in the Strat/Assess textbook and via the MICROSOFT EXCEL field work score book.